My parents house has many fruit trees in their backyard. 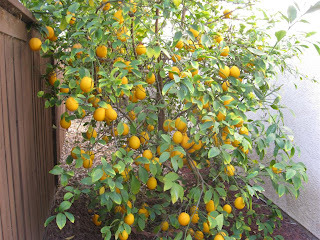 This photo is of their Meyer Lemon tree loaded with lemons. 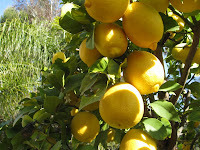 They also have a normal lemon tree, tangelo tree, naval orange tree, and a large tangerine tree. All are full of fruit. It is amazing how much fruit their small (california sized) backyard produces. I always make it a point to bring back some of the Meyer lemons and share them with my Texas family. 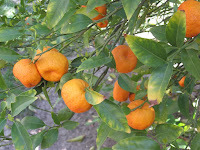 I am also including a photo of the tangerine tree as it was amazing..